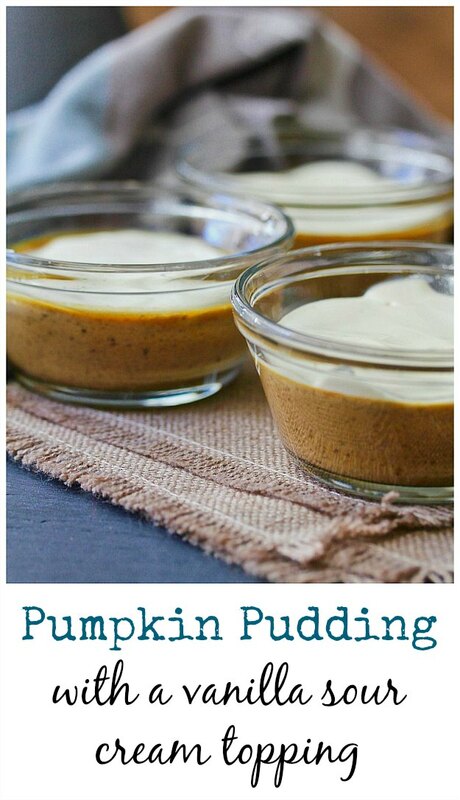 These Pumpkin Puddings with Sour Cream Vanilla Topping are like little individual crustless pumpkin pies. These puddings are baked in little individual custard cups or ramekins, and then topped with the sweetened sour cream topping and baked for five minutes more. This post is sponsored in conjunction with PumpkinWeek. I received product from sponsor companies. All opinions are mine alone. 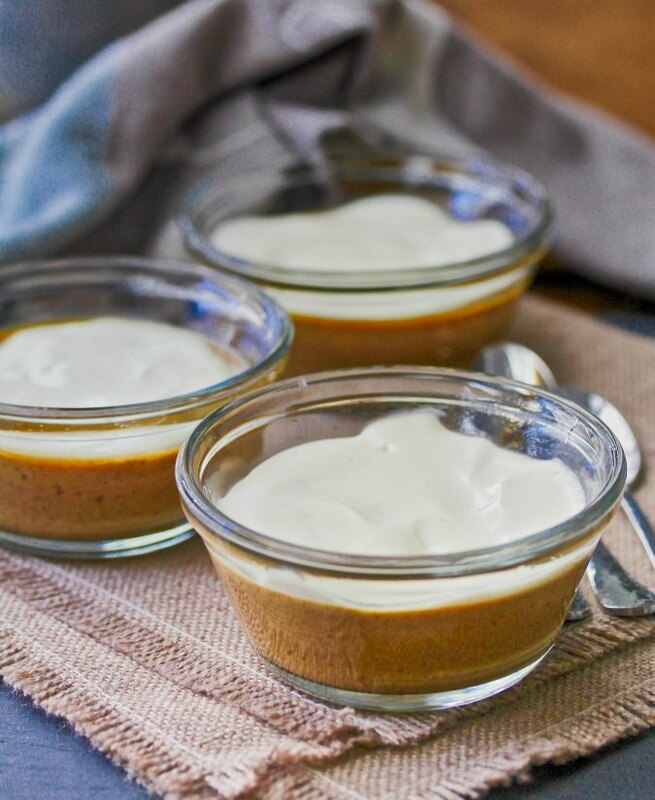 These pumpkin puddings are creamy and silky. To get a thicker and even creamier pudding, you cook the pumpkin puree with the sugar and spices until some of the water in the pumpkin has evaporated. This concentrates the pumpkin flavor. These pumpkin puddings are a great make-ahead dessert. Just chill them in the refrigerator before serving. These were easy to make, tasty, and I loved breaking out the old fashioned custard cups. You can also use ramekins or any other oven proof individually-sized dishes. Welcome back to Pumpkin Week, where you will find dozens of recipes, both sweet and savory, that include pumpkin! You also have a chance to win one of three fabulous prize packages from our sponsors. Just check out this post to read all about the prizes and enter to win. There's only one day left! I was able to use all of our sponsors' products in this recipe, including Dixie Crystals sugar (shout out to them for including an Instant Pot in their prize package! ), Cabot Creamery sour cream, and Eggland's Best eggs. Many thanks to our sponsors for providing such nice gift packages for the give-away. After the recipe, be sure to check out the rest of the #PumpkinWeek recipes. Combine the pumpkin, sugar, spices, and salt in a food processor and mix for 30 seconds. Transfer the mixture to a saucepan and cook over medium high heat until it is simmering. Reduce the heat to medium and cook for 5 minutes, stirring regularly. Reduce the heat a bit more, and whisk in the milk and cream. Transfer the mixture to a heat proof bowl or large measuring cup, and cool slightly. Slowly whisk in the eggs. Divide the mixture among 7 to 8 heatproof custard cups and place them on a baking sheet. Bake the puddings for 35 to 40 minutes, until a knife comes out clean. While baking, mix together the sour cream, sugar, and vanilla. When the puddings are done, remove them from the oven, leaving the oven on. divide the topping among the ramekins, spreading it quickly with the back of a spoon. Return the baking sheet with the puddings back into the oven for 5 minutes. Cool completely on a wire rack at room temperature, and then refrigerate. Pudding is such a comfort food to me. This version sounds lovely. Thanks Sally. I'm looking forward to making some savory dishes with pumpkin too for a change. Love this! I looked high and low and the ONLY Cabot products I could get locally were cheese. What a fun, pumpkin treat! Our kids will love making and eating this! It's definitely a kid friendly treat!